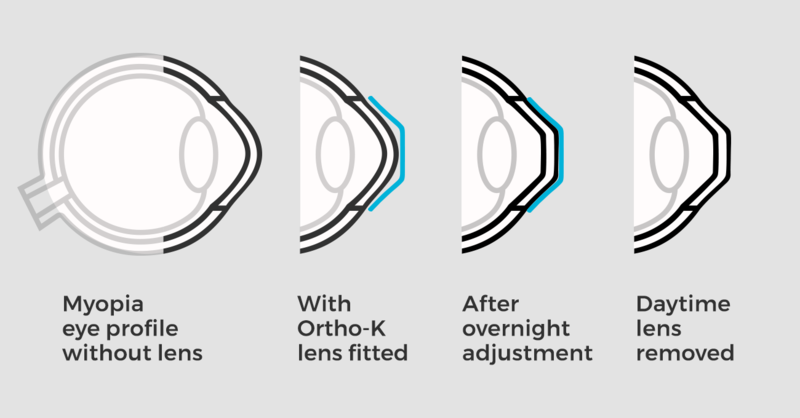 Ortho-K, also known as corneal reshaping and orthokeratology, is an excellent alternative to glasses or contact lenses. If you were thinking about having Lasik surgery but were told for one reason or another that you would be a poor candidate, Ortho-K is an excellent option. Ortho-K is a specially fit pair of gas-permeable lenses that you would only wear at night. While you sleep, the lenses will gently reshape the surface of your cornea. When you wake up in the morning, you will be able to see clearly without the need for glasses or contacts. Are the Effects Of Ortho-K Permanent? The effects of Ortho-K are not permanent. This is why the lenses need to be worn every night. If you go 72-hours without wearing the lenses, your vision will go back to its original state. Why Are the Ortho-K Lenses Prescribed? There are two main reasons that these lenses are prescribed. Correction of refractive errors: These lenses are most commonly used to treat nearsightedness. However, they are also used to treat hyperopia and astigmatism. In some cases, it can be used to correct presbyopia. Slow the progression of childhood myopia: Over the last several years, these lenses have been used in children 9-years-old and over. They have shown great success is slowing the progression of myopia in children. To start treatment with Ortho-K, you will need a special contact lens fitting. First, your optometrist would measure the curvature of your cornea. It is a painless procedure that creates a topographical map of the surface of your eye. This test takes just a minute. You may need to wear a series of temporary lenses until you reach your prescription. This is normal. How Long Does It Take For Ortho-K To Reach Its Maximum Effect? The length of time before you reach your best vision with Ortho-K depends on the strength of your prescription. For lower prescriptions, it can take just a night or two. For stronger prescriptions, it can take up to two weeks for maximum correction. When you start the Ortho-K treatment, you will likely feel them in your eyes until you fall asleep It isn't pain, it is awareness. After you have been wearing them for some time, you won't feel them in your eyes any longer. If you are considering Ortho-K treatment, you should schedule an appointment with Sites Vision Clinic in Clarksville. Our optometrist will perform a complete eye exam to determine whether you would be a good candidate for the procedure. Next, our eye doctor would schedule your fitting. You will work with our doctor of optometry until you are ready for the permanent lenses that you would wear to bed every night.